Hi friends! I hope you all had a very Merry Christmas!! I had an insanely busy month, as I'm sure we all did, so it was nice to kinda "unplug" for a while. My niece and her family also visited from Colorado which was nice. My Christmas unit as well as christmas linky parties were put on hold. I know I promised some Christmas graphing sheets, and I truly am sorry I didn't get around to it. But I do have some New Year's graphing sheets and some Black History Month freebies coming soon! 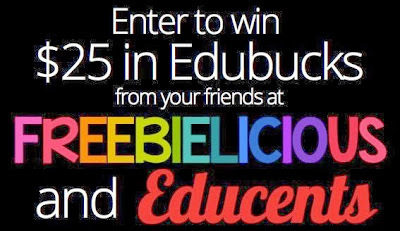 Anyhow, The gals at Freebielicious have teamed up with Educents to bring you this awesome giveaway which I am secretly hoping I win!! 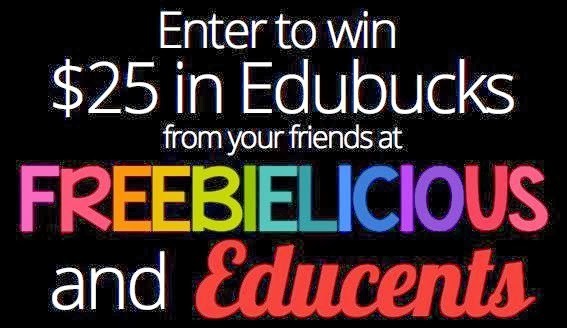 You can enter to win $25 from each Freebielicious blog- that's $450 worth of GOODIES!! Head on over to the Freebielicous blog and enter to win before it's too late! !